From Lake Ontario and the St. Lawrence River (at the top of the image) and extending to Long Island (at the bottom) this image shows the varied topography of eastern New York State and parts of Massachusetts, Connecticut, Pennsylvania and New Jersey. The high "bumpy" area in the middle to top right is the southern and western Adirondack Mountains, a deeply eroded landscape that includes the oldest exposed rocks in the eastern U.S.
On the left side is the Catskill Mountains, a part of the Appalachian Mountain chain, where river erosion has produced an intricate pattern of valleys. Between the Adirondacks and Catskills is a wide valley that contains the Mohawk River and the Erie Canal. On the northwest (top) of the Catskills are several long, narrow lakes, some of the Finger Lakes of central New York that were carved by the vast glacier that covered this entire region as recently as 18,000 years ago. The Hudson River runs along a straight valley from right center (near Glens Falls), widening out as it approaches New York City at the lower left on the image. The Connecticut River valley has a similar north-south trend further to the east (across the lower right corner of the image). The Berkshires are between the Hudson and Connecticut valleys. Closer to the coast are the more deeply eroded rocks of the area around New York City, where several resistant rock units form topographic ridges. 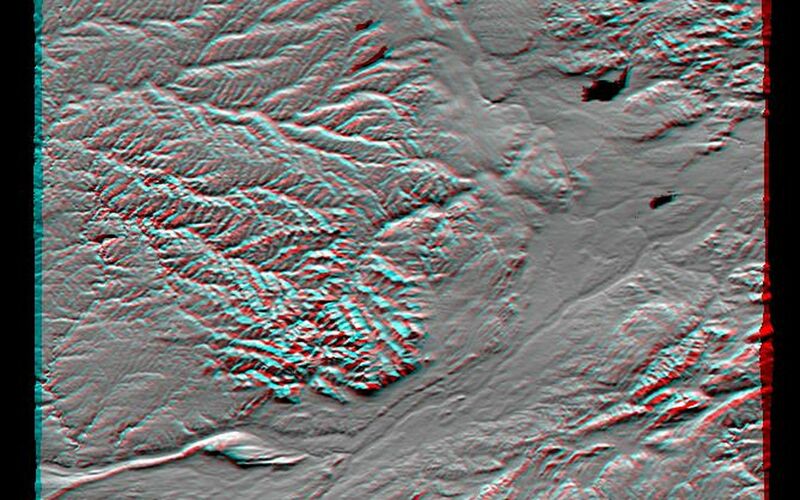 This image product is derived from a preliminary SRTM elevation model, processed with preliminary navigation information from the Space Shuttle. Broad scale and fine detail distortions in the model seen here will be corrected in the final elevation model. 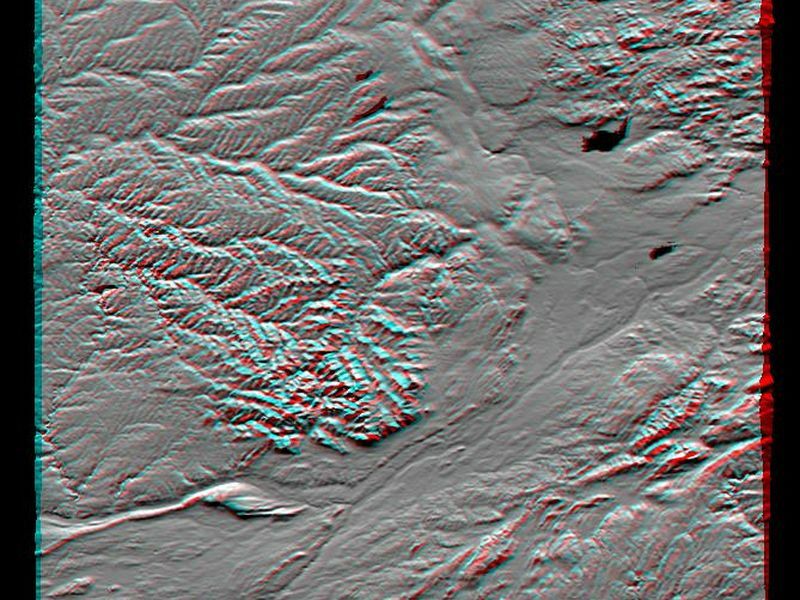 This anaglyph was generated by first creating a shaded relief image from the elevation data, masking the large water bodies, and draping the result back over the elevation model. Two differing perspectives were then calculated, one for each eye. When viewed through special glasses, the result is a vertically exaggerated view of the Earth's surface in its full three dimensions. 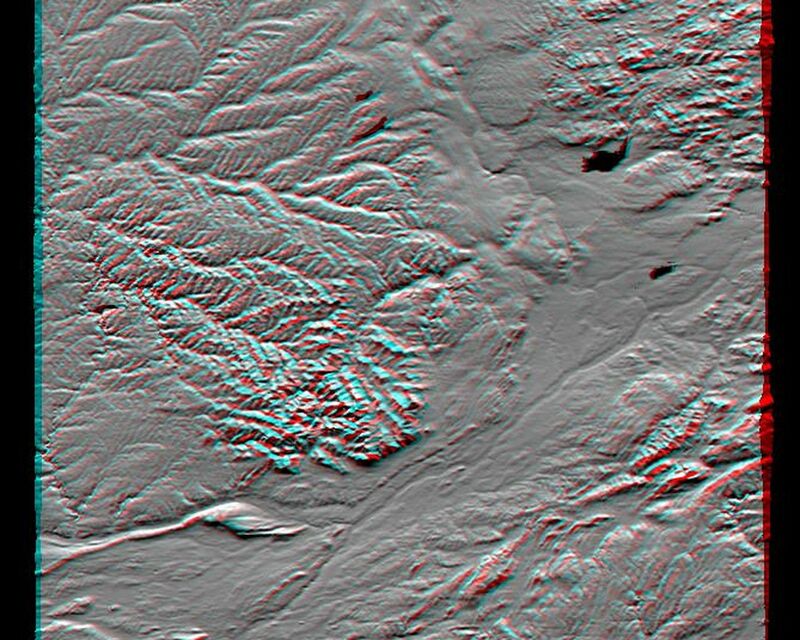 Anaglyph glasses cover the left eye with a red filter and cover the right eye with a blue filter. This image was acquired by the Shuttle Radar Topography Mission (SRTM) aboard the Space Shuttle Endeavour, launched on February 11, 2000. SRTM used the same radar instrument that comprised the Spaceborne Imaging Radar-C/X-Band Synthetic Aperture Radar (SIR-C/X-SAR) that flew twice on the Space Shuttle Endeavour in 1994. SRTM was designed to collect three-dimensional measurements of the Earth's surface. To collect the 3-D data, engineers added a 60-meter-long (200-foot) mast, installed additional C-band and X-band antennas, and improved tracking and navigation devices. The mission is a cooperative project between the National Aeronautics and Space Administration (NASA), the National Imagery and Mapping Agency (NIMA) of the U.S. Department of Defense (DoD), and the German and Italian space agencies. It is managed by NASA's Jet Propulsion Laboratory, Pasadena, CA, for NASA's Earth Science Enterprise, Washington DC. Location: 43 deg. North lat., 75 deg. West lon. NASAs Terra spacecraft obtained this ASTER image on April 10, 2019, of Perus Sabancaya stratovolcano. The ARIA team at NASAs Jet Propulsion Laboratory created these flood proxy maps depicting areas of Mozambique that are likely flooded as a result of Cyclone Idai. NASAs Terra spacecraft shows Lake Karakul in northeast Tajikistan, a hypersaline lake with no external drainage, receiving less than 3 cm precipitation per year.